Laissez le bon temps rouler! Let the good times roll! It is time once again for Next Step Ministries’ “Unmask the Violence” event. Join us on Saturday, February 23 at Paul J. Ciener Botanical Garden as we bring a bit of Bourbon Street to Main Street, Kernersville! It promises to be an entertaining evening of live jazz, tasty New Orleans inspired delights, exciting auction and raffle items, all for a wonderful and worthy cause. Next Step Ministries was founded in February 1998 after the death of a local schoolteacher at the hands of her estranged partner. Kernersville community leaders saw the need for a local agency dedicated to serving victims of domestic violence and their families. Such agencies existed in surrounding areas, but not yet in Kernersville. Committed to meeting that need, they worked tirelessly to get us where we are today. We started in a mobile home and office, grateful for the space we had. In 2018, we moved in to a brand new, custom built safe house with 5 bedrooms and 7 bathrooms, a playroom, ample storage and office space and a fenced in back yard. We also cut the ribbon on our Community Resource Center (named by First Christian Church in honor of Martha Pearson). This center serves as a central point for us to provide resources to those in our community who may not need temporary housing in our Safe House, but are seeking a support group, advocacy, and/or agency referrals. The mission of Next Step Ministries is “To provide refuge, advocacy and education to survivors of domestic violence and the broader community.” Our new safe house, as well as our Community Resource Center allow us to do just that. The National Coalition Against Domestic Violence reports that 1 in 4 men and 1 in 3 women have been victims of [some form of] physical violence by an intimate partner within their lifetime. That startling statistic tells us that the work that we do is vital and necessary. With the support of proceeds from our Thrift Store, our faith and business community, and individual support, we are proud to have provided housing and basic needs for just over 70 guests, handled almost 700 phone calls to our Crisis Line, and advocated for countless other members of our community confidentially. We hope that you will consider joining us for “Unmask the Violence” to celebrate Next Step Ministries and help us raise some much-needed funds. Last year’s event raised $20,000, and we hope to surpass that number in 2019. The gala will be on Saturday, February 23 from 7-10pm at Paul J. Ciener Botanical Garden. 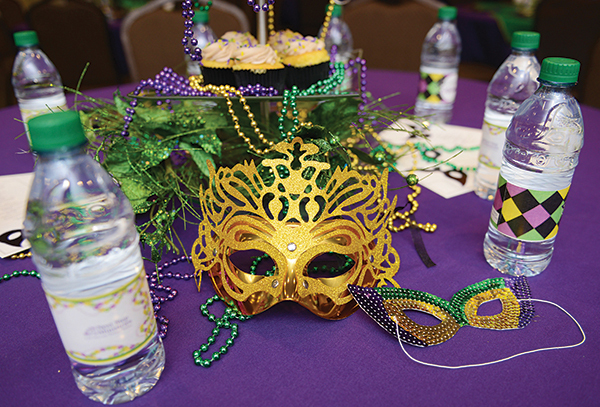 Come dressed in your best Mardi Gras attire-think beads, masks and boas! Enjoy the live jazz, munch on tasty food, and enjoy beer, wine and a signature cocktail (non-alcoholic options available too, of course). Get your raffle tickets and bids in for the live auction and raffle. A night on the town in Winston-Salem including a gift certificate for dinner at Ryan’s Restaurant, an evening stay in luxury and style at the Cardinal Kimpton hotel, and a voucher for brunch for two at the Katharine Brasserie and Bar, located in the hotel itself. Tickets are $50 a person or $80 a couple and can be purchased online at www.nextstepdv.org, or by visiting our Thrift Store (955 Hwy 66S) or Administrative Office (233 West Mountain Street). Corporate and individual sponsorships are still available, as well as various underwriting opportunities. Please call our office at 336-413-7054 with any questions. Tickets last year did sell out, so we encourage you to get your name on the list today! We are eager to make this event our best ever in honor of our founders and those we have been lucky enough to get to serve during our history. Hope to see you there!